I wanted my daughter to understand that she doesn’t need to wear cosmetics with provocative names to feel grown-up and beautiful. What’s Your Virtue?®, a beauty company focused on inspiring women with the belief that beauty starts within, has created a lip gloss aimed to remind women of their virtue each time they wear it. 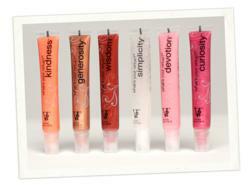 The Lip Bliss™ collection consists of six shades of gloss branded for six different virtues. Founded in 2008, What’s Your Virtue?® began with a mother’s vision to provide her teenage daughter a more wholesome alternative to the cosmetic products being sold on the market. As a result, the product is catching on with women of all ages. In addition to the essential oils, Lip Bliss™ purifies and protects lips with antioxidants, green tea extracts, and moisturizing vitamin E. The proprietary formula is gluten free, contains no fillers or parabens and involves no animal testing. Lip Bliss retails for $12 and is available in more than 80 spas and gift shops in 26 states. For a listing of retail stores or to purchase Lip Bliss online, visit http://www.whatsyourvirtue.com.